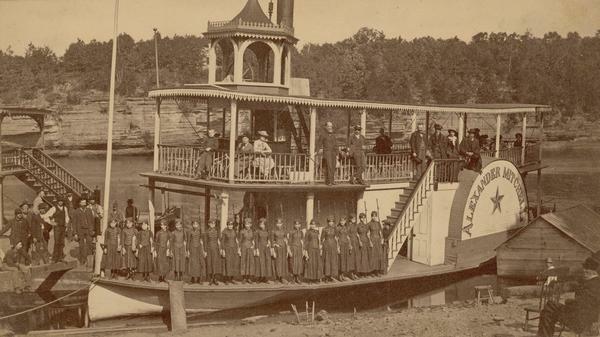 Kilbourn Broom Brigade on the "Alexander Mitchell"
Members of the Kilbourn Broom Brigade on the Alexander Mitchell steamboat in the Dells. Members of the group include: Minnie Smith, Mary Sterlie, Ruth Marshall, Jinny Vanalstine, Mary Conway, Ema Bowman, Nellie Schroeder, Flora Briggs, Hattie Bennett, Mert(?) Markliener, May Henry, Rosa Bonner, Effel Howard, Hattie Snider, Maggie Conway, Nellie Bennett, Flora Loomis, Annie Wisner.